Delve into the most sought after sights in Portugal on this 4 day small-group guided tour of Lisbon, Sintra, Cascais and the Estoril Coast. This tour is based in Lisbon where you will spend three nights in top-notch accommodations. With your guide, explore Lisbon’s famous districts including Chiado, Alfama and Barrio Alto. 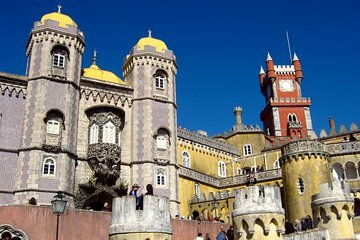 You will see highlight monuments such as Our Lady of the Hills and São Jorge Castle. Plus, savor ample free time to explore Lisbon on your own. On days outside the capital, enjoy full-day tours to the Estoril Coast, Sintra and Cascais. Enjoy personal attention from your guide on this small-group tour, limited to 15 people. Experience the culture, food, and architecture of Lisbon and its surroundings in a small group. Spend three nights accommodation in Lisbon in a standard- or superior-class hotel and enjoy four days touring Lisbon, Cascais, Sintra and the Estoril Coast. In Lisbon, wander with your local guide to historic landmarks on two small-group walking tours. Sail the River Tagus on a ferry ride sunset cruise that ends at a seafood joint overlooking the river. Plus, taste Portuguese tapas, sip liqueur, and watch a Fado show at a traditional restaurant. Relish another day in the surrounding region and see the stunning Pena Palace in Sintra, the golden beaches in Cascais and voyage on the waterfront of the Estoril Coast. During downtime from your tours, continue sightseeing freely or relax at your Lisbon hotel. Lodging is included for three evenings and you can select your preferred location between Lisboa Plaza Hotel (superior hotel) or Residencial Portuguese (standard hotel). Meals included on this tour include three breakfasts at your hotel and two dinners. An example itinerary is shown below and includes a summary of each day. Please note that Day 2 and 3 may be swapped depending on the day your tour begins. After breakfast, explore Lisbon on a small-group guided walking tour with food and wine tastings. Visit the Mouraria district and learn about Fado, Portugal's UNESCO World Heritage–listed music genre. Walk around Rossio Square and Carmo Square, and go up to the top of the Santa Justa funicular. Walk through the old district of Chiado, home to boutiques and old bookstores, and compare it with Bairro Alto, Lisbon’s bohemian district. In the evening, explore more of Lisbon on a sunset walking tour (March to October only). Walk along the former site of the Sant Antão gates (the old city's main entrance) and see the Casa Alentejo, which showcases the culture and food of the Alentejo region. Enjoy a short ride on a vintage tram to Our Lady of the Hills (Nossa Senhora do Monte), and admire the 25th of April Bridge, the Cristo Rei statue and São Jorge Castle. Next, head to Sintra Natural Park, and then enjoy a picturesque drive along the Estoril Coast to see the cliffs of Roca Cape (Cabo da Roca) — the westernmost point of Europe — and visit the surfer's paradise of Guincho Beach. Pass by the cliff at Hell’s Mouth (Boca do Inferno) and stretch your legs in the fishing village of Cascais. On the drive back to Lisbon, enjoy the scenic views of the Atlantic. The tour guide/van driver basically dropped us off at each location without even telling us the highlights of every site. We were left on our own to wander around. A very informative and interesting tour, visiting many beautiful places with lots to taste on the way - both food and other beverages. Amazing time in an amazing city with extremely friendly tour guides and lovely people. The superior hotel booked was excellent with a good breakfast. I found all the tours underwhelming. Although the guides did a good job there was too much time spent in the minibus. The best tour by far we did was the extra one, the afternoon wine and food tour. Great value. Excellent tour! Totally loved every single day in Portugal from the streets, to the food and the people especially our guides on the multiple tours. This tour is combination of several full and half day tours. It was really enjoyable and recommend it to all. Hotel was in the best location. Inside Lisbon gave amazing tours of Lisbon and surrounding destinations. Thanks Viator for arranging my visit. Better to book independantly than do this 4 day thing. I choose it thining value for money but hotel was terrible (not even 2 star). I enjoyed the walking tours bud Fado and dinner were poor. Sintra and Pena Palace were great but we were rushed through the other places, did not even stop at some places. The next day the walking tour was great and there was plenty to see and do in addition to eating and drinking. The night tour that was the dinner and fado was SPECTACULAR. The sintra tour was also good, just the right amount of time in each location to take in what they have to offer. Excellent tour! Hotel Fenix was very nice! Guides Paulo and Nadia were fantastic.